Jurkat and HEL cell lines. Our Abpromise guarantee covers the use of ab59509 in the following tested applications. WB Use at an assay dependent concentration. Use under non reducing condition. Predicted molecular weight: 37 kDa. 1.3X105 HEL cells were lysed by the following lysis buffer: 10mM Tris, pH 7.4, 150mM NaCl, 1mM CaCl2, 1mM MgCl2, 0.02% NaN3, 1mM PMSF, 0.5 lg/ml leupeptin, 1 lg/ml pepstatin A, and 10 KIU/ml aprotinin containing 1% detergent (Brij 97 or Triton). The lysate was separated by SDS/PAGE (5–15% gel) under non-reducing conditions and transferred to a PVDF membrane. ab59509 incubation time was 1h. 1,3 105 HEL cells were lysed (lysis buffer containing 1%Brij97 or triton) Migration SDS/page 5-15% gel under non-reducing conditions. ab59509 staining CD82 in Rat placenta tissue sections by Immunohistochemistry (IHC-P - paraformaldehyde-fixed, paraffin-embedded sections). Tissue was fixed with paraformaldehyde, permeabilsed with 0.3% Triton X-100 and blocked with 3% serum for 60 minutes at 23°C; antigen retrieval was by heat mediation in 10mM citrate buffer pH6.0. Samples were incubated with primary antibody (1/200 in blocking buffer) for 12 hours at 4°C. A Biotin-conjugated Goat anti-mouse IgG polyclonal (1/100) was used as the secondary antibody. ab59509 staining CD82 (left) in Human peripheral blood neutrophils by ICC/IF (Immunocytochemistry/immunofluorescence). Cells were fixed with paraformaldehyde, permeabilized with 0.3% Triton X-100 and blocked with 1% BSA for 30 minutes at 22°C. Samples were incubated with primary antibody (1/100 in PBS + 0.1% Triton-X 100 + 1% BSA) for 12 hours at 4°C. An Alexa Fluor® 488-conjugated Goat anti-mouse IgG polyclonal (1/1000) was used as the secondary antibody. Middle - LFA 1a, Right - merge. Overlay histogram showing HeLa cells stained with ab59509 (red line). The cells were fixed with 80% methanol (5 min) and incubated in 1x PBS / 10% normal goat serum / 0.3M glycine to block non-specific protein-protein interactions. 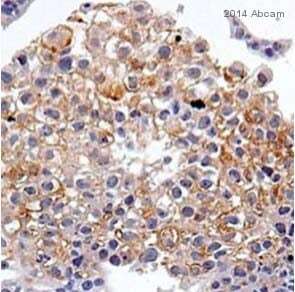 The cells were then incubated with the antibody (ab59509, 1µg/1x106 cells) for 30 min at 22ºC. 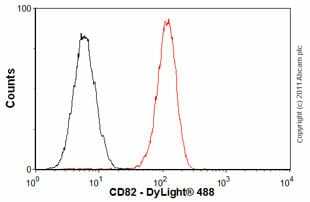 The secondary antibody used was a goat anti-mouse DyLight® 488 (IgG, H+L) (ab96879) at 1/500 dilution for 30 min at 22ºC. Isotype control antibody (black line) was mouse IgG1 [ICIGG1] (ab91353, 2µg/1x106 cells) used under the same conditions. Acquisition of >5,000 events was performed.